Milan Marco Polo City Map 2018: the ideal map for your trip. Let the Marco Polo city map of Milan guide you around this awe-inspiring city. Highly durable and waterproof, this handy, pocket-size Milan map folds away easily and is always on standby to help when you're stuck. Laminated finish - it feels like paper but it's waterproof, durable and tear-resistant! This hard-wearing, little pocket map of Milan will withstand lots of folding and refolding. Pocket size - the handy, light-weight, pocket-size format contains huge coverage of Milan. Public transport maps - the centre of Milan is easy to navigate on foot - but to enjoy all this city has to offer (and if your feet have had enough!) then look no further than the easy reference Milan transport map. 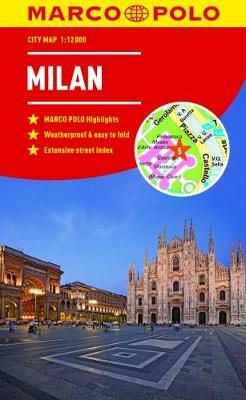 Trust Marco Polo's clear mapping and thorough street index to guide you around the wonderful city of Milan.